Properly fitted golf clubs has a major influence over the ability to swing the golf club efficiently. Poorly fitted equipment is very common in the game of golf and ball flight and consistency can be improved with the correct equipment. We are all different sizes and all swing the golf club different therefore it doesn’t make sense that all golf clubs will suit everyone that plays and improvement can be significant if the clubs are correctly fitted. That’s why there are so many clubs on the market today because people are different and the feel that a club creates can feel good to one person and terrible for the next. This is where the QGPC excels and provides a Club fitting service that is second to none. Over the years we have developed our fitting services to what they are today and we have all the tools required to make sure we get the correct fit for your golf clubs. We assess current equipment using Trackman Launch monitor, use 2D video and pressure plate readings to measure and determine movement patterns. Once we have this information we will test our recommended club with specs that we believe will help performance and compare the data from your club to the properly fitted equipment using the world’s best launch monitor. All our putter fitting is done using the world’s leading putting analysis system SAM Putt Lab. Our Indoor Performance Studio has an indoor putting green where we use SAM to analyse 28 different parameters of the putting stroke. From this we can adjust lengths, lie and loft of a putter to suit your stroke and to define a putter head that will suit you best, based on aim, putter arc, head rotation and visual aesthetics. 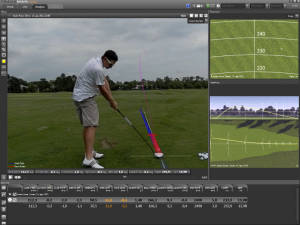 Gap fitting simply looks at the distance gapping between the clubs in your golf bag. Many times golfers are sold clubs that go the same distance and doesn’t really serve a purpose therefore serves no purpose being in your bag. We use Trackman to measure the distances that you hit each club in your bag and make sure there are no major gaps where this could cause an issue on the golf course. In some cases the lofts on your clubs may need to be adjusted to achieve the desired gaps. We use gap fitting to Identify if there is a club needed to be added to your bag to fill a distance. Our iron fitting process uses State of the art launch monitor technology to measure the ball and club parameters that are crucial to determining the correct iron selection. We always test current equipment to give us a baseline and depending on what we find with this test we will then recommend a set of specifications that we will test and measure across our fitting brands to find the best irons for you. With the use of Launch monitor and experience we look at working out the correct combination of fairway woods and hybrids that are going to best suit your game. Important to get the loft gaps correct to maximise launch and to achieve a landing angle that is going to help you find the greens easier. You also don’t want to overlap with the distance each club goes so we are cautious not to sell you 2 clubs that go the same distance. At QGPC we have made a significant investment in world leading technologies that allow us to measure and capture to give us valuable information which will help to custom fit the right equipment that will improve your game.